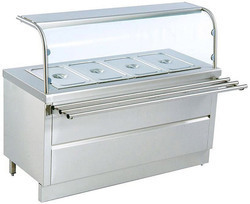 Prominent & Leading Manufacturer from New Delhi, we offer masala trolley, hot bain maria with tray slide, hot bain maria with sneeze guard, bain marie, table top hot bain marie and hot food service trolley. 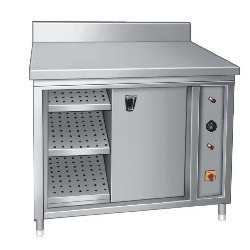 Royal Equipment Co. are the leading Manufacturer, Supplier, Exporter, Importer and Wholesaler of Commercial Kitchen, Bakery and Refrigeration Equipment. and supplying a wide array of Masala Trolley. 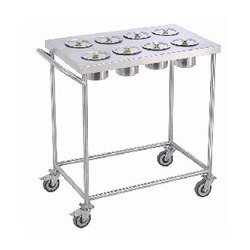 Basically used for keeping masala and spices, the trolley provided by us is manufactured by utilizing optimum quality raw material and sophisticated technology under the guidance of our dexterous professionals at par with international quality standards. 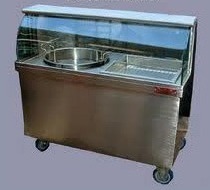 Beside this, clients can easily avail this Masala Trolley from us in diverse sizes and finishes at affordable prices. Known in the market as a manufacturer, trader, and supplier, we are engaged in presenting Hot Bain Maria with Tray Slide. This table with tray slide is processed by using basic material which is best in quality and leading technology. Apart from this, our quality experts examine this table with tray slide on quality factors to make certain a default free range to our customer’s end. Fostered with vast industry experience, we are engaged in manufacturing, trading, and supplying a broad range of Hot Bain Maria with Sneeze Guard. The provided range of table with sneeze guard is developed with the usage of best material of market and newest technology along with the market norms. In addition to this, the given assortment is applauded for its performance and long operational life. Our customers can simply benefit this table with sneeze guard at industry leading rates. 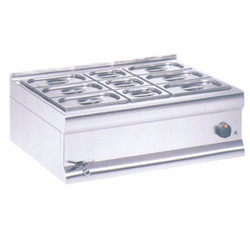 Keeping in pace the varied requirements of the customers, we offer an exclusive series of Hot Bain Marie, Cold bain Marie. It is treasured for its high functionality and quality. Our entire product series are corrosion resistant and highly efficient. We offer it in varied sizes and capacities and it has a huge demand coming from market. 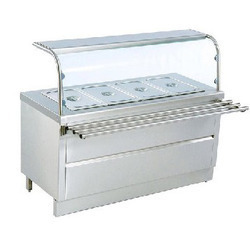 With the assistance of our professionals, we have been able to manufacture, trade, and supply a wide range of Table Top Hot Bain Marie. 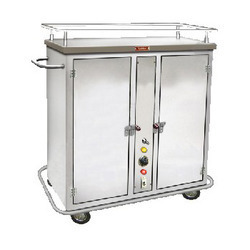 This Table Top Hot Bain Marie is processed according to the market norms. Apart from this, our experts examine the offered table at different factors of quality in order to make certain a perfect range at the customer’s end. This table is usually commended among our customer’s because of their attributes. 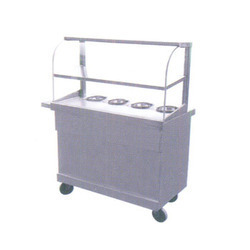 We hold expertise in offering our clients a qualitative range of Hot Food Service Trolley. 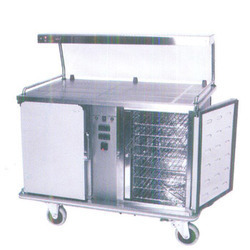 This food service trolley is processed by utilizing best quality factor inputs and new technology. 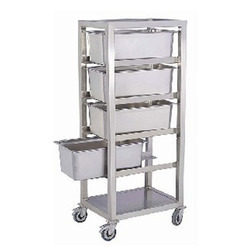 Our presented food service trolley is enormously commended and valued by our consumers. In addition, our quality experts examine the given food service trolley at different parameters to assure a default free range. Royal Equipment Co. 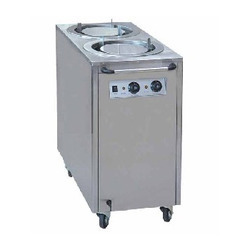 Manufacturer, Supplier, Exporter, Importer and Wholesaler of commercial kitchen, food equipment. 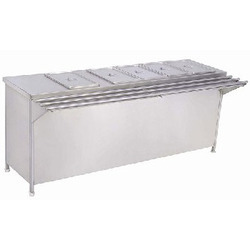 We provide an extensive range of Plate Warmer, which is available in numerous sizes and specifications. With their energy efficiency and low maintenance requirements, these warmers are highly regarded. Royal Equipment Co. Manufacturer, Supplier, Exporter, Importer and Wholesaler of commercial kitchen, food equipmen. 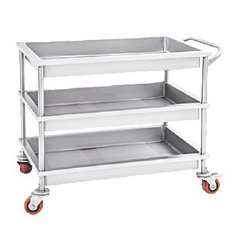 We provide our clients a comprehensive range of Utility Trolley, Service Trolley and Tray Trolley. We manufactured this trolley by using quality approved raw material in adherence to the prevailing market trends. Furthermore, the offered trolley goes through a series of tests for ensuring its flawlessness. Also, we offer the entire range to our prestigious clients at industry leading prices within promised time frame. 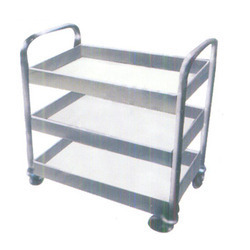 Royal Equipment Co.Manufacturer, Supplier, Exporter, Importer and WholesalerVegetable Rack Trolley, Vegetable Trolley which is widely used for dispersal and transportation of vegetables and other items from one place to another. 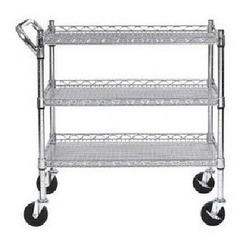 Our customers can get these vegetable rack trolley in varied dimension an specification at affordable price. 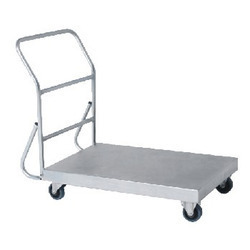 These vegetable rack trolleys are processed with the attached wheels, which make them more suitable to move.